OK, so the circuit breaker tripped. You go to the basement and locate the electrical panel, reset the circuit breaker and "pop", it trips again, or it trips again when you go back upstairs and turn back on what you were using when it tripped in the first place. At this point you need to stop and identify the root cause of the problem making the circuit breaker trip. 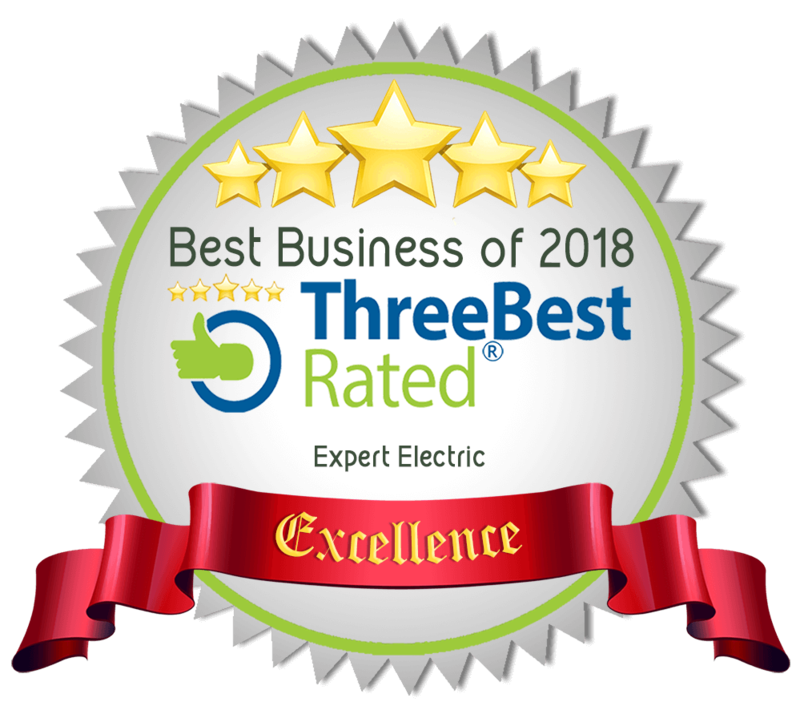 Feel free to Give Expert Electric a call and we will be very happy to help you at any time. How to Reset a Circuit Breaker! If a circuit is overloaded or it shorts, the breaker will trip and cut off electricity to prevent fire and/or electrocution. Follow these steps to turn the power back on. Turn off the light switches and unplug appliances in the room that has lost power. Find your circuit breaker box and open the cover. Locate the tripped breaker. Circuit breakers are small, usually horizontal switches labeled by the areas of the house they serve (for example, "kitchen," "bathroom" and so on). The tripped circuit breaker will be in the "off" position or in a middle position between "on" and "off." Reset the breaker by moving it to the full "off" position and then back to "on." That may clear an overload and return power to the room. If the breaker re-trips, you may have too many lamps and appliances plugged into the circuit; a damaged cord or plug; a short circuit in a receptacle, switch or fixture; or faulty wiring. Identify and correct the malfunction before resetting the breaker. If you DO want to use a number of appliances in a certain area of your home and don’t have enough power Expert Electric would be happy to run additional circuits to the area requiring more electrical power. Fuses and circuit breakers are designed to interrupt the power to a circuit when the current flow exceeds safe levels. For example, if your toaster shorts out, a fuse or breaker should "trip", protecting the wiring in the walls from melting. As such, fuses and breakers are primarily intended to protect the wiring -- UL or CSA approval indicates that the equipment itself should not cause a fire. Fuses contain a narrow strip of metal which is designed to melt (safely) when the current exceeds the rated value, thereby interrupting the power to the circuit. A fuse can only trip once, then it must be replaced. Breakers are fairly complicated mechanical devices. They usually consist of one spring loaded contact which is latched into position against another contact. When the current flow through the device exceeds the rated value, a bimetallic strip heats up and bends. By bending it "trips" the latch, and the spring pulls the contacts apart. Breakers can be reset a finite number of times - each time they trip, or are thrown when the circuit is in use, some arcing takes place, which damages the contacts. Thus, breakers should not be used in place of switches unless they are specially listed for the purpose. Neither fuses nor breakers "limit" the current per se. A dead short on a circuit can cause hundreds or sometimes even thousands of amperes to flow for a short period of time, which can often cause severe damage. If you have an older home you may have a fuse panel. Most homes these days have circuit breaker panels. Both serve the same purpose; to protect the branch circuits from overloads and to trip in the event of a sustained short circuit. Some common fuse and circuit breaker sizes you'd find in your home are 15 amp, 20 amp, 30 amp, and 40 amp. Generally speaking a 15 or 20 amp circuit breaker protects your normal branch circuits containing lights and receptacles. Clothes dryers are normally protected by 30 amp breakers while ranges are protected by 40 amp breakers. You will find that older homes have few branch circuits where everything seems to run off of one or two fuses which creates the problem of tripped breakers or blown fuses. You may think that the solution to this would be to simply install a larger circuit breaker or fuse. This can create dangerous overloading of branch circuit conductors. Conductors are rated by how much continuous current they can safely carry. A #12 cable can carry up to 20 amps while a #14 cable can carry 15 amps. By installing a 30 amp breaker or fuse on a 15 or 20 amp branch circuits you will be exceeding the rating of the cable. A dangerous situation may occur if a cable carries more current than it's rated for. Large cables, with less resistance, can carry more current than smaller cables, which have more resistance. It's like a garden hose, the larger the diameter the more water it can carry. The smaller the diameter the less water it can carry. When a circuit is overloaded the conductors will start to produce heat which in turn can melt the insulation covering and cause an electrical fire. Rather than installing larger fuses and circuit breakers, do it the right way by breaking up reducing the number of outlets on overloaded circuits. These days’ houses are wired much differently with circuit breaker panels housing 32 to 40 branch circuits. The big advantage of circuit breakers is that they can be reset where fuses have only one life. To reset a circuit breaker first turn it all the way off and then you can switch it back to the on position. When a fuse blows you have to replace it. It's a good idea if your home has a fuse box to keep 1 or 2 spares of each size fuse right beside the fuse panel so that you can find them easily when needed. It is highly recommended that you replace your old fuse panel with a circuit breaker panel. If you happen to sell your house, one of the main concerns a prospective buyer, or home inspector, has is the electrical wiring and breaker panel. Old overloaded fuse panels will definitely be a major issue. Replacing your fuse panel and updating any unsafe wiring will go a long way when and if you decide to put your home on the market.